Rolisteam is a free virtual table software. Pen and paper Role playing games are traditionnaly made around table. Virtual table software seems to be the right solution to overcome real life difficulties. It is also multiplatform software (Windows, MacOS and Linux). Download it here : http://www.rolisteam.org/download then install it on your computer. 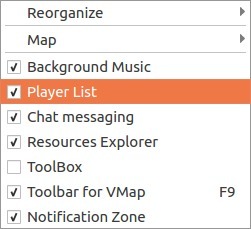 Rolisteam provides many features to live a better game experience (such as : maps, images, dice roller, charactersheet, background music). Rolisteam is available in several languages: english, french, spanish, german, portuguese, hungrian, dutch, romanian and partially in turkish. Now, Let’s explain how to use Rolisteam. Many screenshots illustrate this tutorial to make it funnier and easier to understand. On start, Rolisteam appears and above it there is the connection panel. This panel allows you to add and set connection profile. You must set correct values to ensure the connection establishement. “Player” profile requires definition of player’s character as well. This panel may store several connection profile. Change the default profile or create another one. We recommand to set a meaningful name. It makes it easier. For example, I use to play as GM on Wednesday and as player on Monday, names of my profiles are: Game on Monday, Game on Wednesday. GMs (Game Masters) have more control and power over Rolisteam than players. They can add maps or images. They control background music and many more stuff. The differences between host and client may appear not really obvious. Hosting the game means that all game players must connect to you. If the hosting Rolisteam is closed, everybody will be disconnected from the game. The Player area is dedicated to describe yourself. You have to pick up (nick)name (it will appears to other players) and select a color. For a better game experience, it is better than all players chose a very different color. The last thing is a checkbox “I am the game master”. Check it only if you are the GM, obviously. If you are a player, the connection panel allows you to describe your character thinks of the “Character” zone. It is displayed only when you are not the game master. You must set the character name, color and avatar. It is recommanded to use square image as avatar (for better good looking on vectorial maps). If you host the game, the server must be on your side. You don’t need to set an address. You must pick up a port and check “Host the game”. When you are confident about your connection profile, you must click on “Connect”. If everything goes right, the connection profile dialog disappears and let you access to the main application window. In the notification area (Top right corner), there is a reminder of connection information you should give to other game participants. As you can see, the address in our case is 194.250.98.228, and the port is 6661. 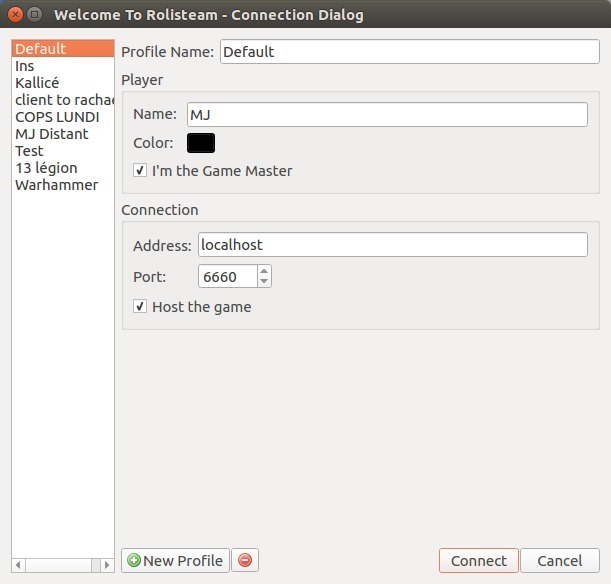 By default, Rolisteam use the port 6660. You can change it as you want but please avoid port number used by another service. Chose the host carefully, bandwidth and stability are the main two criteria. Game experience will be better. DSL line is enough and do the job perfectly. Keep in mind, the host must stay until the end of game. Everyone will be disconnected if the host is off. 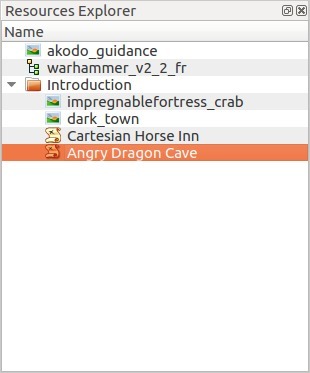 If you connect as client, you need an address and port number to join the game. Rolisteam can access IP address (example: 194.250.98.228), or domain namee (rolisteam.org, games.foo.com). The host must give you those information. Uncheck the “host the game” checkbox. Then you are all set. Click on Connection. If it goes right, the connection dialog disappears and you have acces to the application. When the connection is set, you must see something like this. Lets pay a visit to all panels to see which informations you can find in which panels. On sides of the application, there are dockwidgets. You can move those dockwidgets, let them floating or group them. So you can group them to see important ones all the time. Others can be seen when you want/need by clicking on their tab. Of course, those dockwidget can be closed (the cross on the top right corner). You can hide/show dockwidget thanks of the subwindow menu. To know at any time you connection status, just look at the title bar of rolisteam. 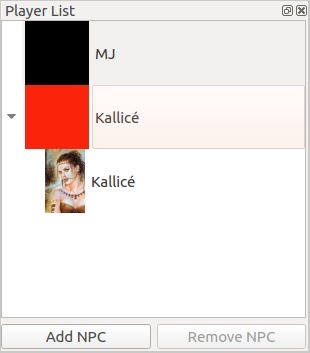 There are in that order: current story name, software version, Connection status «connected» or «disconnected», connection type ( client or server) and the application’s name Rolisteam. As you have seen, the notification area is useful when hosting the game. It gives you all information you need to send to other players. This panel have more features than that. All events on the network are logged inside it. So you can see new incoming connection or player’s disconnection. It provides progressbar for long (receiving) transfert. This area lists all instant messaging windows. By default, Rolisteam sets global messaging (to everyone) and point-to-point connection to each other players. You can create chat window and set it with all/one/many/no players. You can talk about your next tactic. This panel displays all connected players and theirs characters. You can expand or collapse the character lists for each player. Character’s avatars can been seen here. 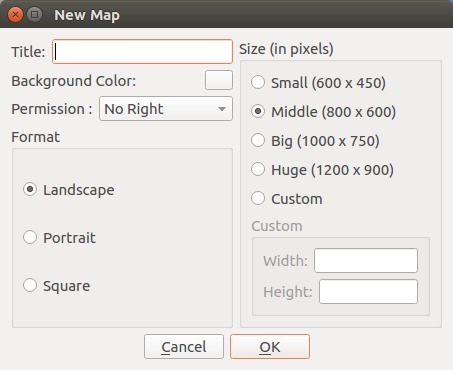 This panel is very important when you are using maps in Rolisteam. We talk about it below in this document. Rolisteam has three audio players to manage three tracks at the same time. You may hide them if you need fewer audio players or more space. All commands are available through contecxtual menu (right-click). 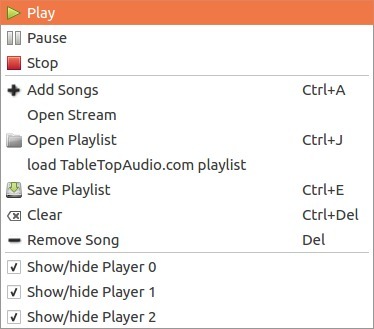 You may load playlist, audio files or links to stream and remote files. The resources manager keeps track of all files you have opened in rolisteam. It provides a way to re-open them really quickly. You may sort files into folders. Now, you know each panel of rolisteam. We will focus on features and how to use them. To open chat messaging, nothing simpler, you have to check chat you want. 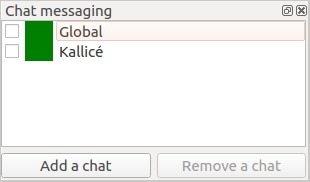 It is useful to open «global». You can discuss with all other players. You can discuss only with one other players. If chat name are blinking from green to red, it means you received message. You may add new chat with whoever or when you want. On the bottom, there is a button to add new chat. Chat has name, owner and participating player lists. The owner is automatically set. You can chose all the other parameters. Just click on “Ok” to validate. What can we do in chatwindow ? The main feature is obviously to send messages to other players. You can be identified as yourself or as your character. It is usefull to split in game talking and ooc talkings. Rolisteam convert all http address to clickable link. You can describe your character action with the command /me followed by the action description. /me draws her sword and adopts a defensive stance! 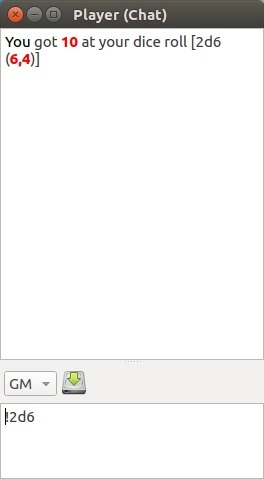 You can easily resend messages thanks to message history. 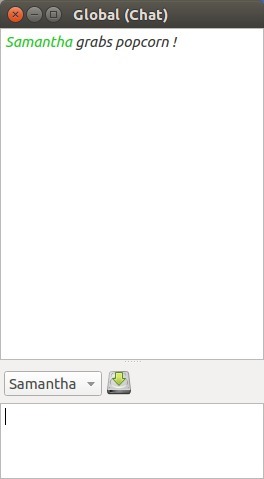 Just press up and bottom to navigate inside the history and then press Enter to resend the selected message. You can change the background color of chat window. Chat windows can be put out of Rolisteam. It provides a better control of the workspace. You can display timestamp on message reception. 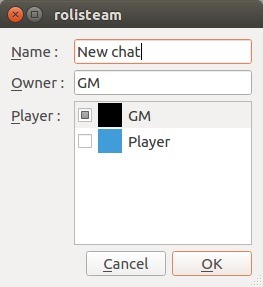 Chat window is also where you can roll dice by sending commands. 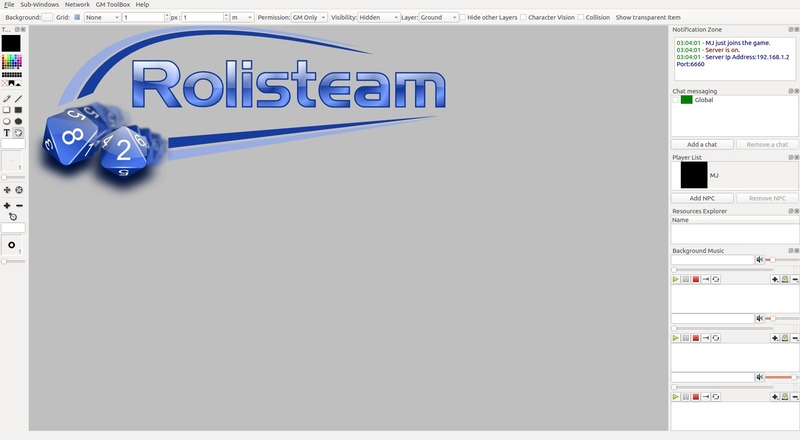 Rolisteam embeds a powerful engine based on generic operator. The exclamation mark is important, It marks the beginning of dice command but it can be replaced by some other characters. & marks a secret command. Only you can see the result. # send command to the GM (and only him/her). Rolisteam can roll any kinds of dice. The result is always displayed in red for better readbility. Rolisteam deals with many operators, you can find complete list on this web page. There are examples as well. To share/find game specific command, please go to Rolisteam forum. Complex system may require complex and long command. The alias system is dedicated to help in this case. It provides a way to simplify commands. This command implements the Roll & Keep system from «Legend of the 5 rings». It is painful to write the command every time. A shorter command will be appreciated and more pratical. To do so, Rolisteam provides aliases. To write a clever alias, you have to think about few points. First, identify the changing part of the system. Does the dice number change ? Does the difficulty threshold change ? Those are the questions you should ask yourself. In our case, the rolled dice and kept dice change. So, you can define an alias in the preferences dialogs. There are two kinds of alias: Alias by replace (like the previous example) Alias by regular expression. Please, take a look at the documentation to get more information about aliases. Every one can share picture to all others. This picture appears on everyone screen. 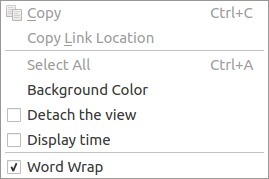 Each user may hide it by clicking on title bar. It can be shown again thanks of Subwindow Menu. The GM or the picture owner may close it definitivily (menu file > close or keyboard shortcut Ctrl+Echap). To share picture, you can do it through menu : File > Open > Image or drag and drop on the main area. It is also possible to share image from the internet. Since v1.8, Rolisteam provides two kinds of maps: Bipmap or vectorial. There are based on two different technologies and concepts. With “bipmap” map, items are painted on map. For vectorial map, items are “drop” on the map. The GM is the only one to create and share map. It is possible to add empty map. Empty map has size, permissions and background color. Alternatively, it is possible to open as background of map. To open an empty map, just click on file > new > Map or just press CTRL+M. Rolisteam asks you to define many map properties. 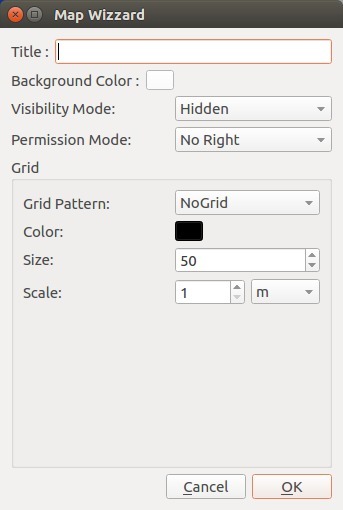 There are 3 permission modes: No permission, Character and All permissions. “No permission” means only the game master may modify the map. “Character” allows players to move their character token. “All permissions gives Game Master rights to all players. 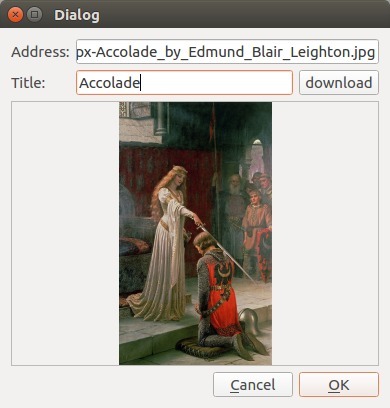 This dialob box allows to select a background image. 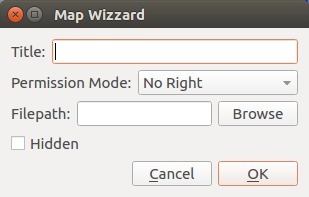 Alternatively, it is also possible to load map (.pla) from your computer. Some map properties must/should be defined such title, Permission mode and visibility. Check “hidden” if you want your map to appear cover with fog of war. You will reveil the map little by litthe to your players. When the map is opened, you can paint on it. To do so, Rolisteam provides many painting tools. There are brough together in the map toolbox. 1. I need more colors than pre-defined ones, how can I get more ? It is possible to double-click on the current color to pick a color thank of color selector dialog. 2. How can I changed character orientation ? When tools 17 or 18 are selected, it is possible with right-click to change orientation. A white mark appears to indicate where the character looks to. 3. How can I change character state ? Just select the tool 18 and click on character until you reach the proper state. 4. What’s the meaning of the handle ? You can catch the map and move it to display another part. It is very useful when you have small screen. Vectorial map has been introduced in Rolisteam v1.8. It’s a huge change and it will be too long to describe in details all the possibilities. In this tutorial, you may find usual feature descriptions to draw map. It is recommended to train yourself at least once or twice before use this feature in game. It may be confusing to discover feature behavior while you are playing. Another tutorial will be written to details all possibilities about vectorial maps. If you need more information about vectorial map, please go to the documentation. To create an empty vectorial map, please go to the menu File > new > vectorial map or directly CTRL+V. Rolisteam asks values for some vectorial map properties. When all items are set, just click on OK to make appears the vectorial map. For your information, vectorial map has no size. The size is infinite. When map has appeared, you can modify it. There are two kinds of modifications: visual or access. First, All visual modifications can be performed thank of tools from toolbar or on the map itself. Double-click on it to pick up color through color selector dialog. In **Normal** mode, you can paint on the map . In **Masking** mode, you can hide parts from players. It adds fog of war. To move items, just click on any item, keep pressing mouse button and just move the mouse (it is a drag and drop action). Modifying size or shape, you have to press `MAJ` and move handler. To select several items at once, just press `CTRL` and click on different elements. Link (child) item to another (parent). Then, if you move the parent all his children will move as well. On the map, Rolisteam provides contextual menu. Through those menu, many actions can be run. The menu content depends on the current selection. If you want to know about all features available from contextual menu, please read this documentation page. The GM can broadcast background music. Rolisteam has 3 audio players. They are independant. 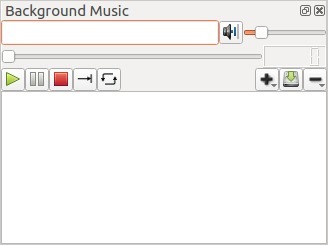 Each player has standard and expected features from audio player. Control the playing state with Play, Pause and Stop buttons. Audio players accept playing mode: Only one, One by one, loop. Only one mode plays the current song and stop at the end. One by one mode plays the current song and then play the following song. It stops when it reaches the playlist’s end. * loop mode plays the current file again and again. The - button means to remove music from the playlist, long click shows the clear function which clear the playlist. All of these functions are reachable from the contextual menu. Due to legal issue, Rolisteam does not send audio data. It takes care of synchronizing audio players. If you can’t put your files on the internet or to have an audio stream, you have to send files to your players. They have to store audio files in their computers. thanks of some cloud services, sharing and synchronizing directory has become really easy. Alternatively, TableTopAudio.com playlist works like a charm. It could be useful to record all events about the game. To do so, Rolisteam embeds text editor to take minutes about the game: important NPC, evidences etc. Notes can be saved as html, pdf ou .odt. Since v1.8, Rolisteam manages charactersheet. 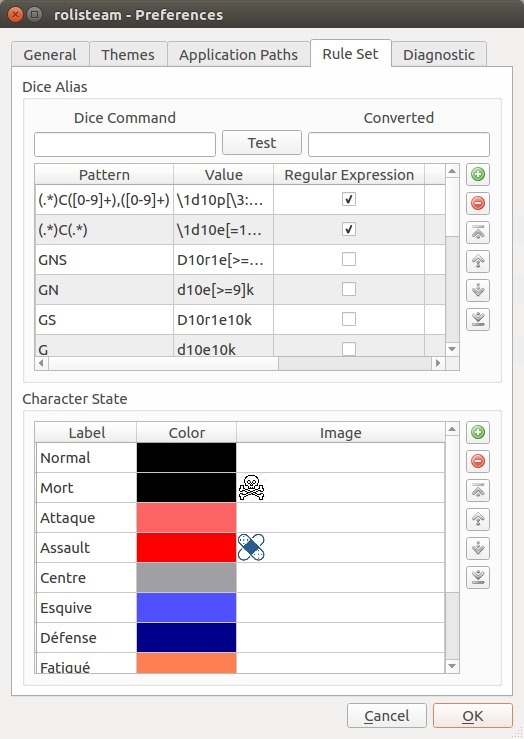 Rolisteam comes with RCSE: “Rolisteam CharacterSheet Editor”. RCSE is the best compagnon when editing charactersheet. make modifications on fields (set label and other properties), return to step 3 until you reach the quality you want, save your work often. On the character tab, add characters and set appropriate value to each field and save you work. Load the result file in Rolisteam and share character with its player. We will written Tutorial about how to make character sheet. Using charactersheet in Rolisteam is simple. The GM loads the character sheet (.rcs). Then, Gm must share charactersheet (right-click menu) to player’s character. A player may have many characters. A character belongs to only one player. Character owns only one charactersheet. We bring together all character sheets in one git repository, additionnaly, you can discuss about charactersheet on the forum. Scenario brings together all rolisteam supported media into one file. Maps, vectorial maps, images, charactersheet, playlists and minutes are stored inside the scenario. Other medias will come in the future. Those documents are listed into the resources manager. This panel shows which document is currently part of you scenario. The state of each document is stored as well (Open, loaded and unloaded). It is important to understand the media workflow. The easiest example is an image. When you drag and drop an image into Rolisteam. Everyone sees it. The image is loaded and open. When you click on the cross on the corner of the window, the image disappears for you only. In this situation, the image is still loaded. To show it again, you can go on the subwindow menu. To close it for everyone, you must go to File > Close (CTRL+ESC). File state is set to unloaded. however, the file appears into the resources manager as part of the scenario. You can move it into chapter for better lisibility. Or, you can remove it when it is unnecessary to keep it. This tutorial is now over. Others will follow. I hope it was helpful. I only have to wish you good games with Rolisteam.